After graduate school, I began working out with a friend who introduced me to workouts he does in the military – high intensity, circuit type training that incorporates bodyweight exercises, Oly lifting, Powerlifting, etc. At that point, we started training military personnel every day at 5am in the morning (which is where I learned a lot about my personal coaching style). Even though we didn’t know it at the time, we were doing what we now know as “CrossFit.” Fast forward a year or so and I did my first true CrossFit workout — 7 minutes of burpees. From that point on, I was hooked even though it left me on my back gasping for air! My Master’s Degree is in Organizational Psychology with an emphasis in motivation and it was here that I began coaching runners of all levels, from the weekend warrior to the avid marathoner. 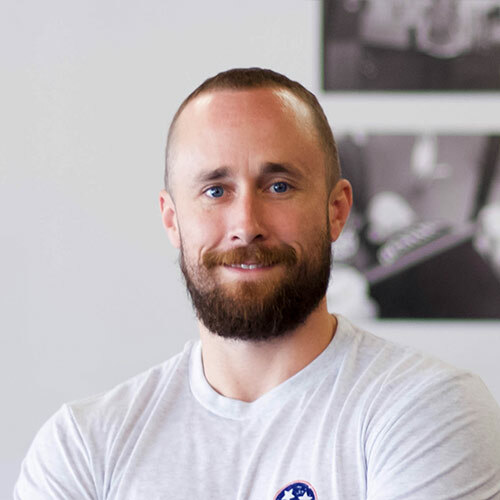 This combined with the amazing experience of working with our nation’s heroes on improving fitness for specific job-related tasks was what made me want to pursue becoming a certified CrossFit coach. I then began working with CrossFit athletes of all skill levels and did all the research I could into this exercise methodology. I haven’t looked back since and that was over 5 years ago. My passion for coaching stems from wanting to help people achieve a better life for themselves, inside and outside the gym. I love helping and encouraging athletes of all skills levels to define, set, and reach the goals they have for themselves. It is truly amazing how training in CrossFit transfers over to so many other areas of life. I’ve been involved in self-defense training (Krav Maga) and am experienced in advanced firearm tactics and both of these have been taken to the next level because my overall fitness (strength & conditioning) and mental stamina has improved because of CrossFit. It is when my athletes see the crossover from CrossFit into other areas of their overall well-being that further ignites my passion for coaching.